We began our collaborative project (see project at the end of this post) by examining the meaning of various words that will be encountered in our lengthy history unit on The Weimar Republic, the rise of the Nazi Party and the Holocaust. These words, rather than just unit specific, are words that underlie major themes throughout our entire year. We started with a matching activity where students matched a word to its denotation and root. The purpose of this was to read the denotations carefully and begin the process of discussing a word to thoroughly understand its meaning as well as to notice how the root informed the structure of the base element. This activity led to a class focus on persecution. Here’s what we have found out. We are able to analyze this into four morphemes < per+ sec+ute+ion> all bound elements; one prefix, one base and two suffixes. 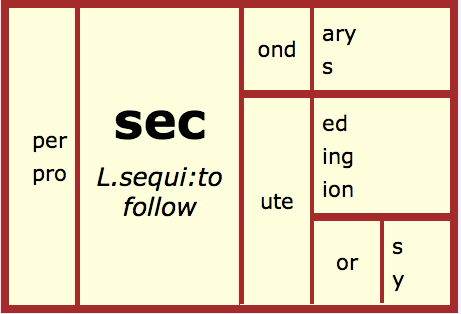 The bound base <sec> from Latin sequi: to follow. We know that execute, execution belongs here as well. The morphemic boundaries in Latin were not as rigid as in English today hence the disappearance of the initial ‘s’, influenced by the /ks/ of ‘x’ in the prefix <ex->. Sadly we could not resolve how to indicate this on the matrix, so see our thinking in the matrix below. 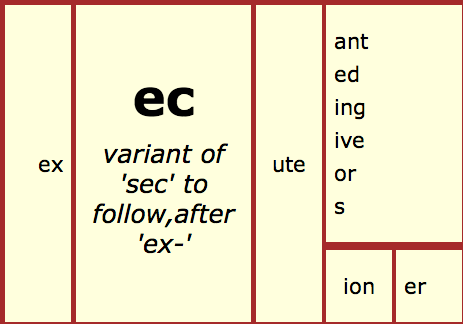 The variant form of the bound base ‘sec’ occurring only after the prefix ‘ex-‘. 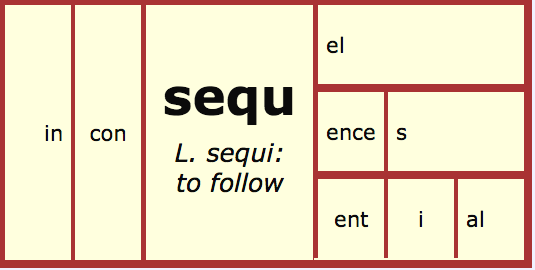 We found sequence and sequel share the Latin root sequi as does the verb pursue and the noun pursuit. I was interested that these words did not enter English together. Pursue is the elder by a century, attested from the 13th century and pursuit attested from the late 14th century. 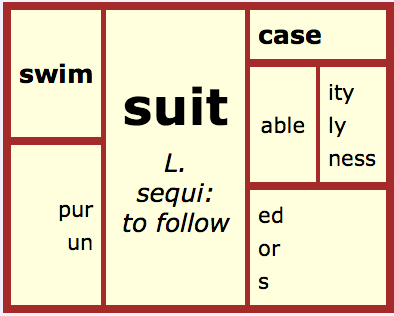 So far we have bound bases <sec> with its variant form <ec>, <sequ> <sue>and the free base element <suit> as related bases in modern English spring forth from Latin sequi. At the heart of all these bases and the words resulting from these, is the idea of following. Our main focus as a class has been in uncovering the meaning and connotations of persecution. It’s not just a matter of spouting a dictionary denotation , although reading the denotation is a indeed a starting point. This has led to rich discussions about persecution. I wanted students to internalize this using their own words, to contemplate when, and why persecution occurs, to consider the nuances of meaning between harassment, humiliation, suffering and victimization. Students noted that persecution was a noun (<-ion> suffix a dead-give-away here), negative in connotation , far stronger than teasing, taunting and harassment. We noted that acts of persecution are intentional, deliberate. We read Wiesel’s words (beginning of post) to consider how silence and indifference perpetuate persecution. Many students wondered if the causes of ‘persecution’ spring from fears of difference. We considered how the root sequi to follow was metaphorical …there is a sense of stalking or following, of relentlessness and cruelty. We found examples of ‘persecution’ in the texts we’d read this year. Listen to the discussions below as students share their understandings after small group and whole group discussion and written reflection. These discussions were followed by reading an article on the history of Anti-Semitism where we discussed the heinous blood libel myth, pogroms, the Dreyfus affair, the fraudulent Protocols of Zion: all part of the prelude to our lengthy study of the Weimar Republic, the Rise of Hitler and the Holocaust. 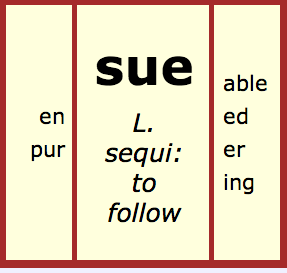 Students wrote about their understandings of this word and where they saw it as a theme in the texts they have read. My teaching colleague and friend Sharon Peters and myself are inspired by The Tiny Book of Tiny Stories– akin to the 6 word memoir, developed as an online collaborative production company hitREcord by actor writer Joseph Gordon Levitt and ‘Wirrow’. (Read more here at Brain Pickings) This interplay of text and image has become another way for students to internalize their understanding of persecution in a concentrated, metaphor-like form. In exploring some of the examples from The Tiny Book of Tiny Stories, students have learned to weigh each word carefully, particularly verbs. We have discussed personification, the effect of the pronouns ‘he’ or ‘she’ and ‘I’, the superfluity of adverbs and adjectives- if the verb is powerful is there any need for further elaboration? Students posted their ‘Tiny Tale’ on a shared doc. anonymously and then chose someone’s that appealed to them to illustrate and to voice. These tiny tales reveal their understanding of the word and the way it can be shown visually. Below is the collaborative project between the two humanities classes. The students feel proud of this work and all claim to have a much stronger understanding of persecution. help students acquire and understand words- knowing the meaning of the root adds a deeper layer of understanding of the word itself. Ann, I barely have words to describe how moved I was by this post. (Though this is not the first time your weaving of art, literature and orthography into a deep examination of our humanity has moved me so). These “Tiny Stories” are crystalline. Thank you, authors for their creation! Thank you, friend, for your inspiration! And as always Skot thank-you for reading these posts and commenting on the students’ work. They loved creating the ‘tiny stories’ and after their investigations and writing feel they understand the word. Your tiny stories are huge! Thank you! Thank-you Gail! The students absolutely loved working on these. More to come! OK, first of all, the whisperer gave me chills. It’s important for that student to know this. Secondly, I am always amazed at this scholarly group’s ability to move mountains with one word, to incorporate art, AND science, AND literature, AND drama, AND technology, AND poetry throughout their investigation and sharing. I desperately want to be in you class! Thanks Dan,I’ll report back to the ‘Persecution Whisperer!! The kids loved this project – no talk or demand for a ‘grade’ they just spent time on it and loved it! More coming soon!